Providing tried and tested, high-standard GCSE resources. 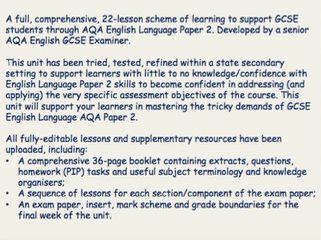 A full, comprehensive, 22-lesson scheme of learning to support GCSE students through AQA English Language Paper 2. Developed by a senior AQA English GCSE Examiner. This unit has been tried, tested, refined within a state secondary setting to support learners with little to no knowledge/confidence with English Language Paper 2 skills to become confident in addressing (and applying) the very specific assessment objectives of the course. This unit will support your learners in mastering the tricky demands of GCSE English Language AQA Paper 2. All fully-editable lessons and supplementary resources have been uploaded, including: A comprehensive 36-page booklet containing extracts, questions, homework (PIP) tasks and useful subject terminology and knowledge organisers; A sequence of lessons for each section/component of the exam paper; An exam paper, insert, mark scheme and grade boundaries for the final week of the unit. 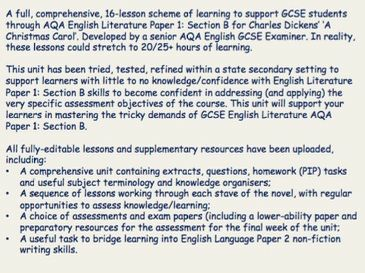 A full, comprehensive, 16-lesson scheme of learning to support GCSE students through AQA English Literature Paper 1: Section B for Charles Dickens’ ‘A Christmas Carol’. Developed by a senior AQA English GCSE Examiner. In reality, these lessons could stretch to 20/25+ hours of learning. This unit has been tried, tested, refined within a state secondary setting to support learners with little to no knowledge/confidence with English Literature Paper 1: Section B skills to become confident in addressing (and applying) the very specific assessment objectives of the course. This unit will support your learners in mastering the tricky demands of GCSE English Literature AQA Paper 1: Section B. 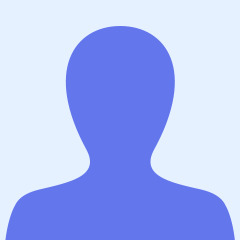 All fully-editable lessons and supplementary resources have been uploaded, including: A comprehensive unit containing extracts, questions, homework (PIP) tasks and useful subject terminology and knowledge organisers; A sequence of lessons working through each stave of the novel, with regular opportunities to assess knowledge/learning; A choice of assessments and exam papers (including a lower-ability paper and preparatory resources for the assessment for the final week of the unit; A useful task to bridge learning into English Language Paper 2 non-fiction writing skills. 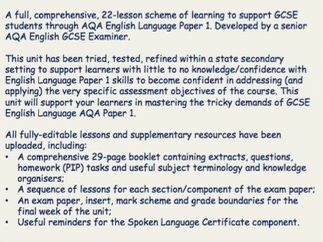 A full, comprehensive, 22-lesson scheme of learning to support GCSE students through AQA English Language Paper 1. Developed by a senior AQA English GCSE Examiner. This unit has been tried, tested, refined within a state secondary setting to support learners with little to no knowledge/confidence with English Language Paper 1 skills to become confident in addressing (and applying) the very specific assessment objectives of the course. This unit will support your learners in mastering the tricky demands of GCSE English Language AQA Paper 1. All fully-editable lessons and supplementary resources have been uploaded, including: A comprehensive 29-page booklet containing extracts, questions, homework (PIP) tasks and useful subject terminology and knowledge organisers; A sequence of lessons for each section/component of the exam paper; An exam paper, insert, mark scheme and grade boundaries for the final week of the unit; Useful reminders for the Spoken Language Certificate component.